The campaign’s initial run proved successful and was met with “lots of enthusiasm, lots of engagement, and lots of likes and retweets,” according to Laura Wells, MBA, the foundation’s vice president of marketing and communications. A second run now is planned for this year. “We have been significantly increasing our activity in social media over the past several years and are really gaining traction and growing our presence and activity. Part of a proactive strategy on our part is to increase engagement with a broader audience,” Wells explains of part of the impetus behind the Know Science. No Stigma. campaign, which she believes “encapsulates perfectly who we are. While stigma isn’t the crux of our mission, getting to the biological causes of mental illness and developing better treatment is. “The foundation funds cutting-edge research to understand, treat, and ultimately prevent and cure mental illness,” she continues, “and we’re seeing great strides in basic research, new technology, next-generation therapies, and early intervention. Everyone has a family member, friend, or coworker who lives with a psychiatric illness. We feel research is the path to progress and really what offers the best hope. To create graphics that social media users could share on Facebook, retweet on Twitter, or pin on Pinterest, for example, the campaign organizers sifted through research and related information from the scientists connected to the foundation, according to Wells, noting that this includes more than 3,700 scientists around the world. One of the messages noted that research by Rachel G. Klein, PhD, a professor of psychiatry at the NYU Child Study Center, showed that early intervention, diagnosis, and monitoring of boys with ADHD helped them lead more productive adult lives. A second message explained that 10% of U.S. high school students have experienced suicidal thoughts, which may result from serotonin disruption, according to research, and that David Shaffer, MD, the Irving Philips Professor of Child Psychiatry in the Columbia University College of Physicians and Surgeons, developed a screening tool schools can use to identify youths most at risk. “Social media permitted us to use these powerful messages to engage people and inform them about research that changes lives,” Wells says of the campaign. 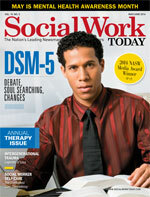 — Tracy Denninger is the senior production editor at Social Work Today.